The Tier Classification System sets consistent facility requirements for power, cooling and resiliency that measure a data center’s potential uptime. Aptly named, the Uptime Institute (UI) created a set of global standards in 1999 for classifying data center infrastructure by tiers. The Telecommunications Industry Association (TIA) created TIA-942 standards, which is also widely utilized. These standards classify Data Centers into 4 Tiers based on critical systems that determine uptime—1 being the lowest, 4 the highest. Each level is progressive, incorporating the requirements of all the tiers below that. 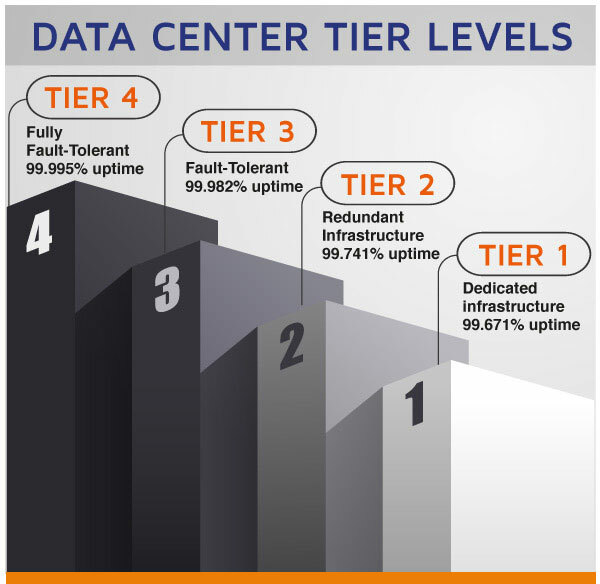 A Tier 4 data center has all the infrastructure of Tiers 1, 2 and 3, with additional components that qualify it as Tier 4. During the certification process, design documents are evaluated to assure they meet the needs of the data center provider’s goals. After construction, a site visit is performed to see if there are any discrepancies between the design and the finished construction. These standards guide a Data Center provider to invest in the necessary infrastructure to meet their business goals and customer requirements, while allowing for differences in design and compliance with local codes and regulations. It guides enterprise customers to find the right level of redundancy for their needs, so they don’t invest more than necessary. The higher the Tier level, the more costly the service. Customers who use a Tier 1 Data Center generally are not dependent on real time delivery of their product or service. Companies who need a dedicated infrastructure solution beyond installing a server in their office for storing data could use a Tier 1 level data center. The level of disaster protection is the lowest in this tier. 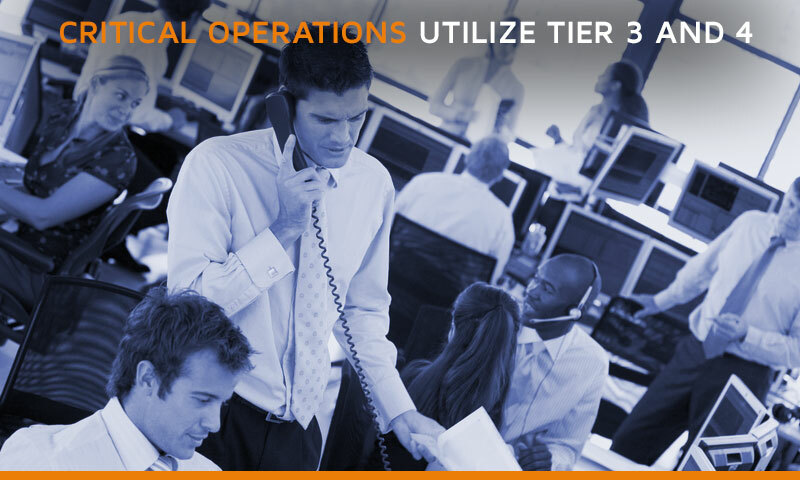 Companies who need access to their data without downtime could use a Tier 2 level data center. Infrastructure includes Tier I capabilities with redundant components for power and cooling, which may include backup UPS battery systems, chillers, generators and pumps. This gives the customers more reliability against disruptions. Companies for whom delivery of their product or service in real time is critical to their operations, such as media providers like Netflix, content providers like Facebook, financial companies, commerce or the healthcare industry will utilize a Tier 3 level data center provider. Infrastructure meets or exceeds Tier 1 and 2 capabilities, with all IT equipment dual-powered and multiple independent distribution paths powering the equipment at all times. Maintenance and repairs can be performed without disrupting service to the customer. For these customers, down time is very costly. Includes Tier I, Tier II and Tier III capabilities, adding another layer of fault tolerance. Power, cooling and storage are all independently dual-powered. The topography of the infrastructure allows one fault anywhere in the system without disruption to service and the least downtime. For enterprises that must stay active 24/7, a Tier 4 data center is ideal. Outages often occur through human error or spontaneous failures of infrastructure components. A Tier IV facility has been engineered to a no-fault standard and will continue to operate despite the downed systems. UI and TIA-942 have made a meaningful contribution to the efficiency and performance standards of the Data Center industry. Interestingly, they stopped certifying facility designs in 2014. One possible reason for their decision may have something to do with changes made to facilities in order to meet requirements for specific tenants. The way one expert put it: something as simple as running a power line to and from a system along the same wall can bump a Tier III down to a Tier II. A high-level Data Center has an experienced facilities manager behind it. They’re the ones who perform emergency system run-throughs and keep the machinery of their deliverables at peak. They know your data is critical to your livelihood. They understand N+1 redundancies but they also know how to prepare for and navigate in a disaster situation. They take operations as seriously as customers take their businesses. Download your Disaster Recovery Checklist!